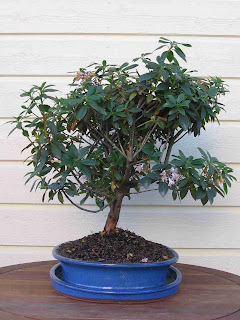 Rhododendron and Azaleas are a common shrub used for bonsai making. 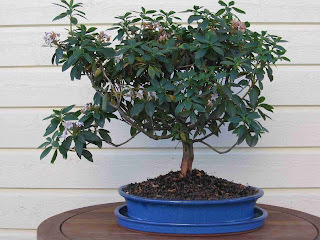 The flowers in the spring make them a nice bonsai to have in any collection. A small leaf variety makes for better bonsai material but finding these are not always so easy. During the spring I came across Rhododendron ferrogineum 'Puncta' (Karoliinanalppiruusu) in a local garden centre. The leaves are much smaller than common garden Rhododendron so I decided to take this and give it a try. The plant didn't come in any container, it was simply planted into sandy soil and had to be slightly dug out of the ground and placed into a paper bag to bring home. I immediately set about putting it into a pot and decided that I would try to fit into one of my available bonsai pots rather than putting it into a training pot. 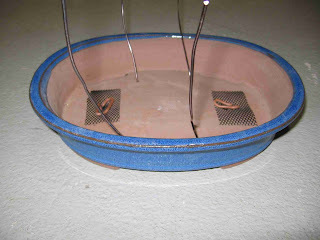 The pot I chose was an oval shaped pot with a blue glazed finish. The oval shape in combination with the blue colour suits well the feminine side of this tree especially when it is in flower. 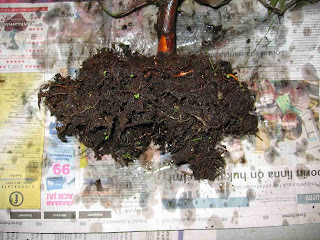 The original soil was quite difficult to remove and some was still attached to the underneath of the plant when I placed it into the pot. The soil mix that I used is the light weight 'gravel' that I have starting using recently mixed with approx. 30% pine bark. As with all of my bonsai they will need some serious styling to be started next year, but the main thing now is to let them grow and establish roots after their repotting to gain the needed strength firstly to survive winter and then be ready to be chopped and pruned.